Graham Nearn, the founder of Caterham Cars, passed away on 24 Oct 2009. He helped develop and sell the original Lotus 7, creating Caterham Cars in 1959 as a Lotus dealership. When Lotus decided to end production in 1972 , Nearn bought the rights to the design and continued building the 7 under the Caterham brand. Today, the company is owned by a management team that bought out the Nearn family in 2005. 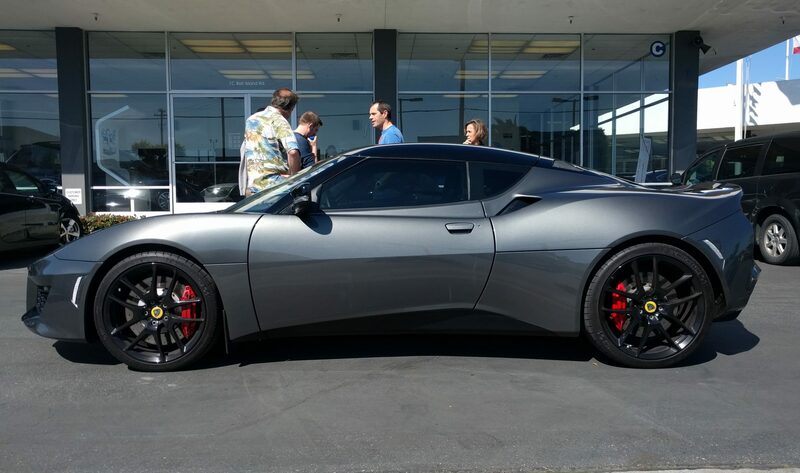 The company builds 600 cars a year and has expanded the lineup to several models. Group Lotus is pleased to announce the appointment of Claudio Berro to the new role of Director of Motorsport for Lotus, reporting directly to Dany Bahar, Group Lotus CEO. Prior to joining Lotus, Claudio Berro held the position of Operations Racing Director for the Speedcar Middle-East International Race Series. Before that, he spent 14 years at Ferrari, Maserati and Fiat where he held such positions as Formula One Team Manager, Director responsible for all sport activities for Ferrari and Maserati (excluding F1), General Manager Maserati Corse and Director of Fiat Group’s Motorsport Activities, before becoming Racing Operations Director for Abarth. This isn’t the first time that Claudio has been associated with Lotus, as early in his motorsport career, he was Rally Co-Driver for Peugeot Talbot Italia in a Talbot Sunbeam Lotus, twice becoming Italian Group 2 Rally Champion in 1981 and 1982. 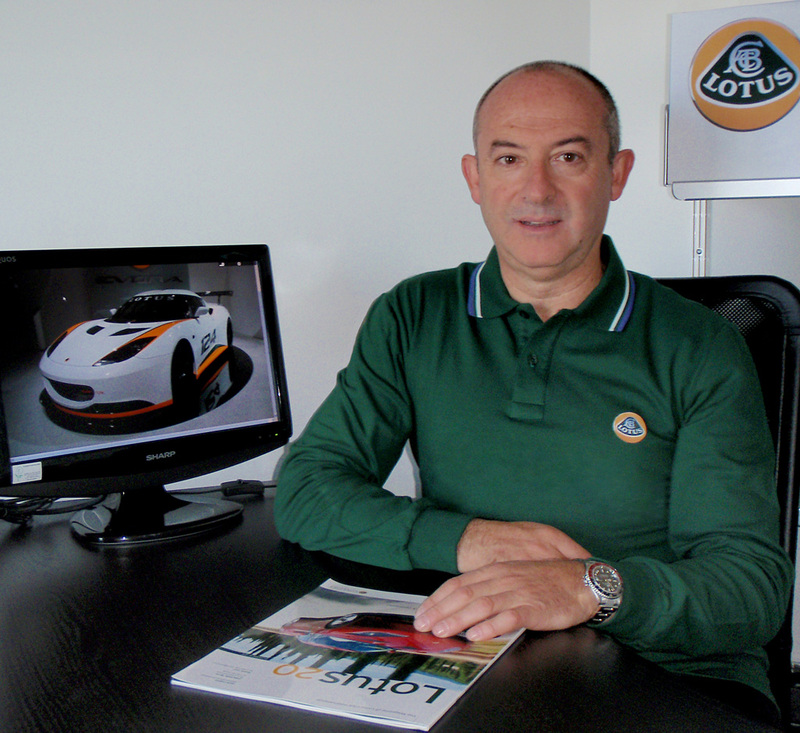 Claudio Berro joins Lotus on the 2nd of November 2009. 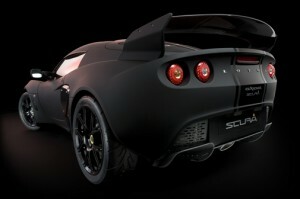 Lotus Cars unveils its latest special edition – the Exige Scura, so called due to its dramatic matt black and carbon fibre theme, at the Tokyo International Motorshow on 21st of October 2009. Translated as ‘dark’ from Italian, the name ‘Scura’ reflects the stealth character of this already fierce looking Lotus and its stunning soft-feel matt black paint finish. Limited to just 35 cars globally, this Exige evokes a desire to ‘indulge your dark side’. This is a serious looking car and enhancements to performance and a reduction in weight from the production level Exige S means that the Exige Scura demands to be driven by a serious driver. Contrasting high gloss ‘Phantom Black’ triple stripes run the length of the car and a carbon fibre front splitter, oil cooler inlet vanes, side airscoops and rear spoiler enhance the stunning distinction between the different textures and exaggerate the tactile quality of the velvety touch to the matt black paint finish. Continuing the dark ‘Scura’ appearance into the interior, carbon fibre is used extensively to compliment the exterior theme and reduce weight. The seats and centre console are crafted from carbon fibre and the handbrake and gear knob have a special anodized treatment which leaves the metal with an anthracite colour finish. All carbon fibre components have been beautifully finished in high-gloss clear lacquer allowing the weave to remain exposed which gives the cabin a raw and racy ambiance. Whilst there is no doubt that this is a visually stunning car, the Exige Scura is not just about its looks – it begs to be taken on track, and its racing character encompasses poise, power and technology to make it a serious contender. Equipped with the most powerful engine in the Exige range and generating 260PS, the Exige Scura achieves a top speed of around 245 km/h and reaches 0-100 kmh in just 4.1 seconds. Considering the performance on offer, the Exige Scura boasts impressive all round fuel economy with an Official European Combined Cycle figure of 8.5 litres/100 km and 6.5 litres/100 km on the Official European Extra Urban Cycle and emissions of 199 g/km of CO2. Orders for the ‘Lotus Exige Scura’ will be accepted from 21 October 2009 in Europe, South Korea, Australia, South Africa, Thailand, Taiwan, Hong Kong, Singapore, New Zealand, Indonesia and Malaysia. This special edition will be available on the same basis in Japan known as the ‘Lotus Exige Stealth’. The Lotus Exige Scura uses the 1.8 litre supercharged and intercooled 260 PS engine from the range topping Exige Cup 260, including the lightweight flywheel and lightweight supercharger pipework. Coupled with Ohlins 2 way adjustable dampers and Eibach Springs with variable height spring platforms, unique matt black lightweight forged wheels and super sticky Yokohama A048 LTS tyres, ride and handling is as expected for a Lotus! Lightweight carbon fibre components, including sports seats, interior centre console, front splitter, oil cooler inlet vanes, side airscoops and rear spoiler help to keep the weight to 10kg less than the Lotus Exige S (at just 925 kg). 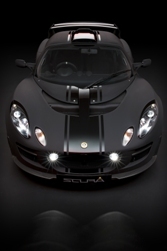 Lotus Launch Control and Lotus Traction Control were originally developed for the Lotus Exige GT3 racing programme. The launch control allows the driver to determine the number of revs they wish to use during a standing start. Having programmed that limit, the driver then holds the throttle pedal down fully and sidesteps the clutch pedal for a very quick departure from the line. The clutch damper cushions the severity of the clutch to transmission engagement to minimise the stresses to the drivetrain. The launch control allows wheel-spin until 10 km/h (6 mph) to further reduce drivetrain stress, after which the traction control assumes its duties at the defined level set by the driver. As with launch control, the amount of traction control required can be dialled in from the driver’s seat and altered on the move to suit the characteristics of particular corners. The amount of traction control can be varied in over 30 increments from an optimum 7 percent tyre slip to completely inactive. The message display in the new instrument pack displays what degree of traction control is being currently utilised. To suit individual driving styles and road conditions, drivers will now be able to tune the Exige suspension with the Ohlins two-way adjustable dampers (which have 60 compression and 22 rebound settings) and ride height adjustment to reduce the ride height from 130 mm to 120 mm. The Lotus Exige Scura is capable of incredible track performance which and at the heart of its success is the aerodynamic package, which produces 42 kg of downforce at 160 km/h (100 mph) increasing grip and stability at higher speeds. This downforce, coupled with a top speed of around 245 km/h (152 mph) and a zero to 160 km/h (100 mph) in circa 9.9 seconds, 0 to 100 km/h in circa 4.1 seconds (0 to 60 mph in around 4 seconds), means that the Exige Stealth is not only stunning to look at but a phenomenal performer too. Combined cycle fuel consumption is 8.5 l/100km and the CO2 emissions 199 g/km. The supercharged and intercooled engine in the Exige Scura has a maximum power output of 260 PS (257 hp) at 8000 rpm and a torque figure of 236 Nm (174 lbft) at 6000 rpm. This significant amount of extra power and torque over the production level Exige S together with the VVTL-i variable cam system ensures that there is a smooth and linear delivery of power from low engine speeds all the way to the maximum 8000 rpm (8500 rpm transient for 2 seconds). The supercharger (with a sealed-for-life internal mechanism meaning that it does not require the use of the engine’s oil) is run from the crankshaft and has an integral bypass valve for part load operation. Charge air (air under pressure from the supercharger) is cooled through an air-to-air intercooler (the air enters via the enhanced roof scoop) before being fed into the engine itself. All charge air ducting has been kept as short as possible with large diameter pipes to minimise restriction and maximise throttle response and efficiency. Four high capacity injectors and an uprated fuel pump add additional fuel under hard acceleration or continuous high speed driving – only on the track, of course! A lightweight flywheel is fitted (giving even greater flexibility and response to the gear change), a sports-type clutch plate and heavy duty clutch cover transfer the engine power and torque to the lightweight C64 six-speed gearbox (with an aluminium casing) – with the same perfectly spaced ratios as the Exige S. An Accusump (engine oil accumulator unit) is included in the whole package as an oil reservoir back-up for extreme track use ensuring that, under those conditions, the engine oil pressure remains constant. Recommended retail price (including VAT) is £45,000 (an additional £950 is charged for on the road costs. These include delivery, PDI, first service, number plates, first registration fee, valet, 12 months Road Fund Licence and a full tank of fuel). The Lotus Exige Scura is painted in a ‘soft feel’ water borne matt black paint finish that is resistant to most normal forms of atmospheric attack provided the special cleaning and maintenance requirements as specified by Lotus are strictly adhered to. However due to the textured matt finish, fading or discolouration of all or part of the matt paint finish may occur during the early life of the vehicle and this is considered normal and is specifically excluded from any warranty given by Lotus. The special matt paint finish utilised on the Lotus Scura is provided with a limited warranty of the earlier of 12 months or 12,000 miles/20,000 km from the date of first registration of the vehicle. Please consult your Authorised Lotus Dealer for full details. 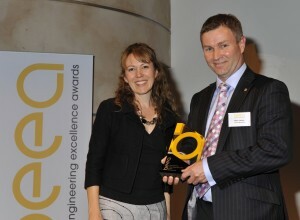 Lotus Engineering, the world-renowned automotive consultancy division of Lotus, has been victorious in the recent British Engineering Excellence Awards, winning the Judges’ Special Award, while also being named Highly Commended in the Consultancy of the Year category. The British Engineering Excellence Awards recognise the design engineering excellence of industry and show the world the depth of variety of engineering design innovation throughout the UK. The Judges’ Special Award was presented to acknowledge a company that epitomised the aim of the British Engineering Excellence Awards by being recognised globally as a world leader in its chosen field of engineering. The judges looked at recent projects that had been undertaken and assessed how Lotus Engineering has been able to diversify its knowledge base and to deliver world class engineering solutions. They were impressed that the company had continued to thrive despite the economic problems experienced by the sector in the last 18 months.